Correct me if I’m wrong, but I believe we all have a special place in our hearts for Chinese take out. There’s just something about the flavors, the packaging; how no matter where you go, the stock images above the register look the same and how it’ll always be ready in just 15 minutes. The thing I don’t like about it is the way I feel afterwards. Can’t really say there has been a time in my life where I didn’t feel a little sluggish a few hours after eating Chinese food. Does that really stop me? Uh no, not until we took it to our own kitchen. I grew up in a small town, and when we received our first Chinese restaurant is when my forever order was born. I have always ordered chicken with broccoli, garlic sauce, and white rice. Something about that garlic sauce that was obviously garlicky and a tad sweet drenching not only my protein and veggie, but covering my rice. So delicious. My gentleband has been making a lot of dinners in our kitchen lately, and he decided to make my favorite dish. However, he forgot that it was chicken, not beef. I ate it and was telling him how great it was and talked about how my order has always been the same. I said it a couple of times as we were sitting there, and then he realized the protein was different, haha! It didn’t really matter because it was so delicious! I’ve requested it a few times just the way he’s made it before. I’m going to share something I’m not proud of: I have a father who doesn’t like garlic. It’s not something I like to share because I stand so firmly with garlic. I am pro garlic! 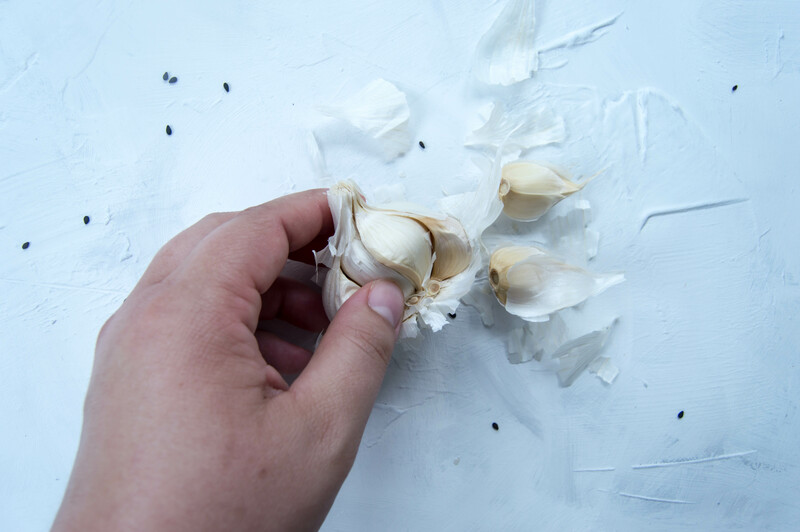 Anytime we use garlic in the kitchen, my nose hairs do a dance and I’m immediately like, “what’s that smell?” It usually is just garlic sauteing in a pan. It makes any bland dish way better. I could probably go on an on about this specific love for garlic, but I will stop here so you can just get to the recipe. In these photos we were using chuck steak, which was a little chewy so I’d suggest paying a little more for a better quality cut of meat. I also topped our dishes with some black sesame seeds, green onions, and some chili oil we had in our pantry. This is really a great dish to make quickly for dinner one week night. It’s also great to make a lot of it and reheat for lunches while at work. So many great opportunities with this! 1 lbs beef- a cut of your choosing. 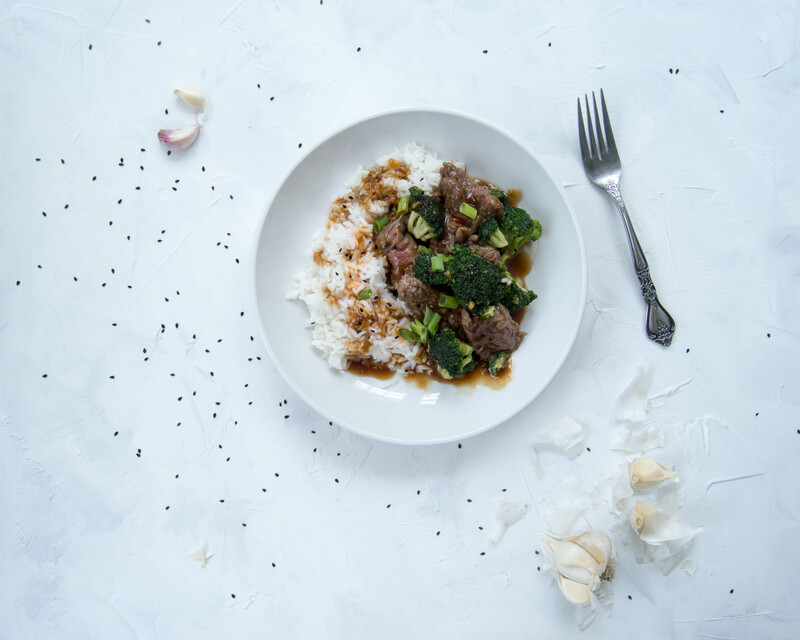 ∙In a bowl mix together soy sauce, broth, rice wine, sugar, sesame oil, and white pepper -set aside. ∙dissolve your cornstarch and water in a small bowl- set aside. ∙Trim off florets of broccoli. ∙Heat a skillet over medium-high heat, add in olive oil, enough to make sure the bottom of the pan is coated and cook until fork tender. You’re still wanting a little crunch to these guys. ∙Halfway through the cooking process of the broccoli add in your meat to the same pan as the broccoli. Cook your meat to the doneness you prefer; we prefer medium rare and suggest this as a serving for this dish. ∙Once the meat is to the doneness you prefer start spooning your sauce in and toss. This step is all preference. 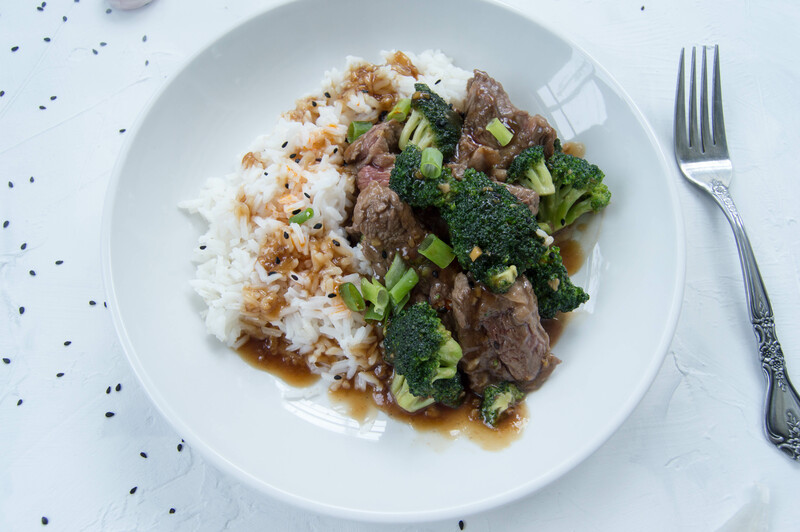 I like sauce, so I make sure that there is enough sauce covering the beef and broccoli as well as a little left over to drizzle some over rice. If you have any sauce left over (you should), keep for another dish! ∙Serve with rice. There’s different types of rice, and I usually prefer a fragrant rice like basmati or jasmine. Pictured here is a medium grain rice.